Love stories with a little bite to them. Vampires didn't always have the best reputation in the world. But novelist Stephenie Meyer changed all that. She’s the author of the Twilight series. Her first book in the series, Twilight, was made into a film of the same name. In Twilight, teens Bella Swan and Edward Cullen meet and start a romance. They fall madly in love but, as in any great tragedy, there’s something that stands in their way. This time it isn’t strict parents or family feuds but something far less ordinary: Edward is a vampire. Although Edward has been brought up as a “vegetarian” vampire (only feeding on animal blood), he still finds his vampire instincts hard to resist when he’s with Bella. Good news! 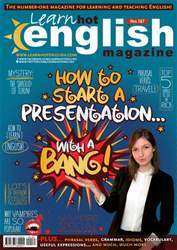 The latest issue of Hot English (187 – the December issue) is out now! Learn over 300 useful words and expressions and improve your listening skills with Learn Hot English! This month: how to start a presentation. Learn lots of useful phrases for beginning your talk. Plus, find out how to really impress the audience. As part of this, you’ll learn about 7 ways to start your presentation with a bang! Plus, 12 useful words and expressions for talking about morning routines, 10 useful words for talking about taxis, useful words for talking about e-mails, 8 expressions for describing people who aren’t very “nice”, “road” idioms, “travel” phrasal verbs... plus: • British culture – unusual games. • Business – Walt Disney. • Film – Patrick Swayze. • Grammar – the Present Continuous. • Mystery – the Shroud of Turin. • Language – typical mistakes. 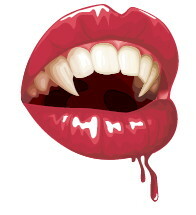 • Culture – vampire popularity. • Politics – Ted Kennedy. • Travel – Rio de Janeiro. • Humour – insurance claims. • Advertising – celebrity advertising. • Politics – Berlusconi. • Animal rights – food celebrities. • Slang – our dictionary of slang. AND LOTS, LOTS MORE! By reading and listening to all this great content, you'll improve your English reading and listening skills and learn up to 300 useful words or expressions. Plus, you'll get a better job and pass English-language exams more easily. Guaranteed! How to fight with conkers! HOW TO START A PRESENTATION! HOW TO MAKE AN IMPACT WITH YOUR OPENING!